Dysplasia of the lumbar joints of the dog is an evolutionary abnormality coxa-femoral joint with the established heredity. It is a common orthopedic disease in population of the dogs mainly of the large ones which cause changes of the capital of the femoral bone and acetabular articulary dimple of the pelvis. The composition and the amount of nutrient for the young generating dogs is the basic factor which influences the development of the dysplasia. Another reason is hard or irregular tension of the dogs in the period of the evolution of the dogs. The dogs are X-rayed for the dysplasia not before the dog is 12 months old, in case of larger ones later, because the evolution of their bones takes more time. These diseases relate to the immune system, where the immune reactions of the organism go against their own textures and organs. The auto-immune diseases can affect one texture or one organ but it can be also a system disease, which affects more organs and textures. The typical signs of the total auto-immune disease are the inflammations of the joints, kidneys and skin, fevers and anemia. 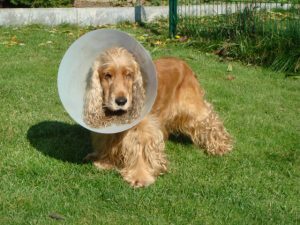 The English Cocker is one of the typical breeds, where the auto-immune hemolytic anemia occurs the most frequently. The signs of the disease are the fast initiation of apathy and weakness, turning pale or up to yellow of the mycosas caused by the decomposition of the hemoglobin, bigger spleen, vomiting and slight bleeding on the musocas. The basis of the successful treatment is the timely diagnosis and the opening of the treatment what is not simple every time because it can be changed with another disease.